Two planes, two continents and an overnight flight later, I finally made it to Rio de Janeiro for the 2016 Paralympic Games! There are four former University of Georgia students competing in this year’s games. Current UGA volunteer track coach Jarryd Wallace will be competing in athletics, Lindsay Grogan in swimming, Amanda Dennis in goal ball, and Michelle Schiffler in sitting volleyball. Schiffler won silver in the 2012 London Paralympics. The Opening Ceremony is set to schedule on Wednesday so I had a little time to sight see before the work starts! Originally, the plan was to head to Cristo Redentor (Christ the Redeemer) which is one of the Seven Wonders of the World but foggy skies interfered with the plans to do so. 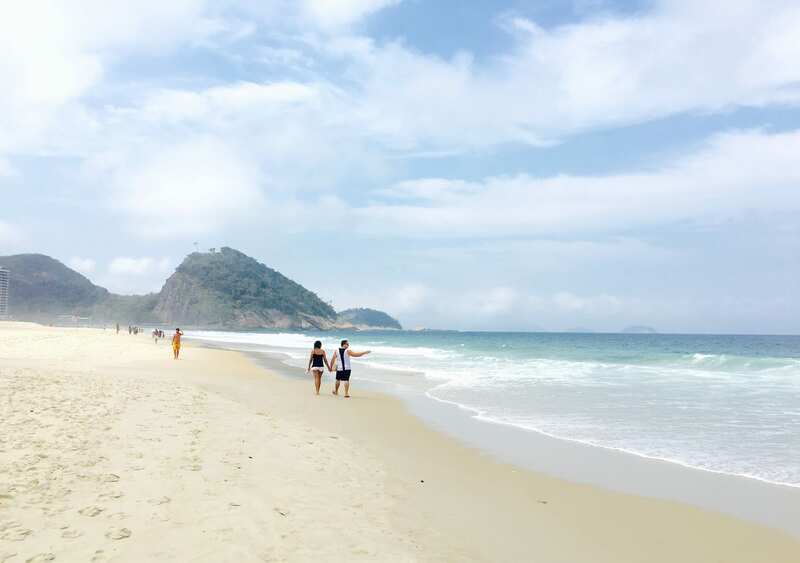 Instead, I headed out to the infamous Copacabana Beach. 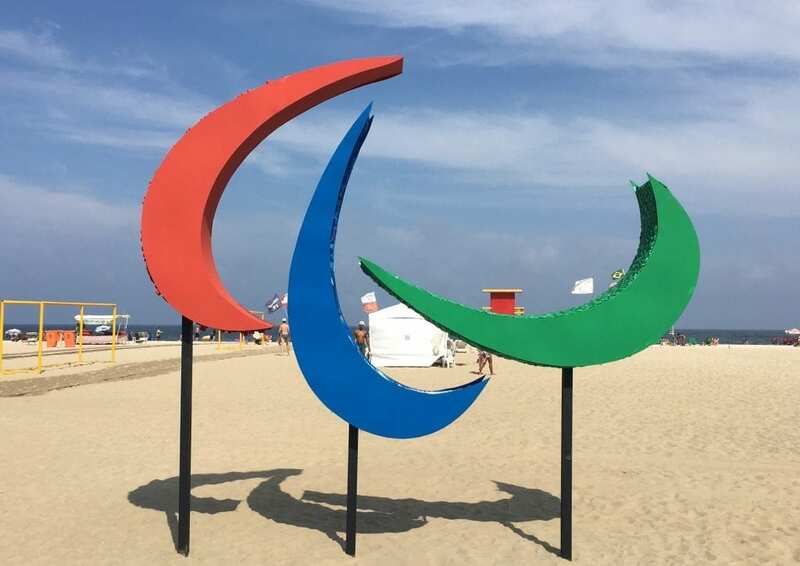 Halfway down the beach between the palm trees and coconut stands stood a “sustainable masterpiece” of the official Paralympic Games symbol, the Agito. The entire statue was built from recycled plastic and the coolest part was that each individual Agito had a different scent. The red Agitos smelled like guarana, which is a common berry in Brazil. The blue piece smelled like the fabric softener from the recycled bottles which the green Agito smelled like mint. Brazil is slowly transitioning out of winter currently but the weather is around 75-85 degrees during the day, not too bad of a winter. After a quick bite on the beach, it was off to Olympic Park to check in. I ran into a familiar face once I arrived, Ashley Rosenberg, who graduated in 2015 from the University of Georgia, and most importantly, a former Newsourcer! She is producing content for the live video board for the Paralympics after doing so for the Olympics. For all the worries there were about security in Rio, I feel pretty safe after the first day. From the airport to the credentialed area, the Brazil National Force patrols the area at all times with weapons. And to even get into the media area, you must go through security clearance and credential authentication. Then, once you’ve actually made it into the media area, there are still security at each entrance double checking credentials. Everything seems pretty calm as of now, the Paralympic Games start on Wednesday so that’s when all the action will begin! Make sure to follow us on Snapchat at gradynewsource and online for more updates from Rio! Jamie Han is a senior at the University of Georgia in Rio as part of a Grady Sports class providing coverage for the Associated Press.